We both make every attempt possible to be thankful every day of the year. We are both happy and healthy and that is certainly reason to give thanks daily. However, it is always enjoyable to celebrate a “season” of Thanksgiving. We began on Sunday…and from the looks of our social calendar I think we may conclude the week of feast and festivity when we return to work on Monday. 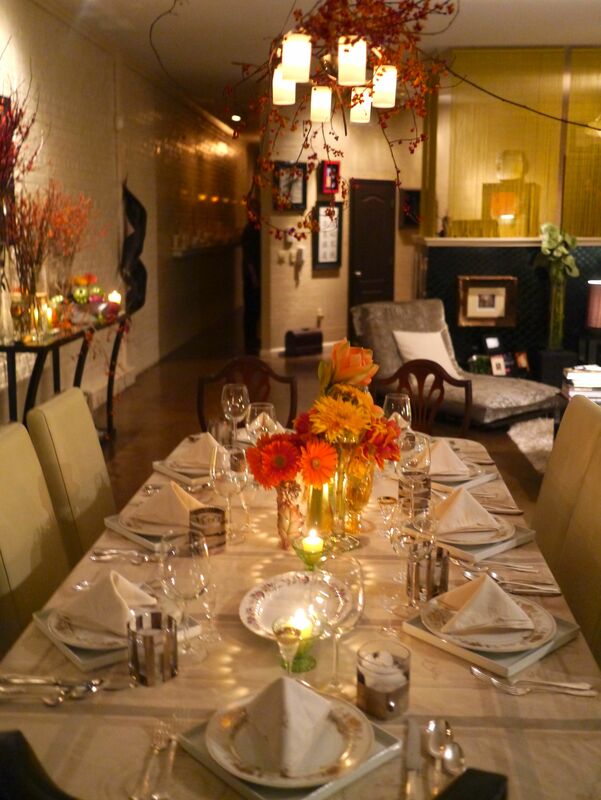 Our Supper Club gathered on Sunday to kick off the Holiday Season. 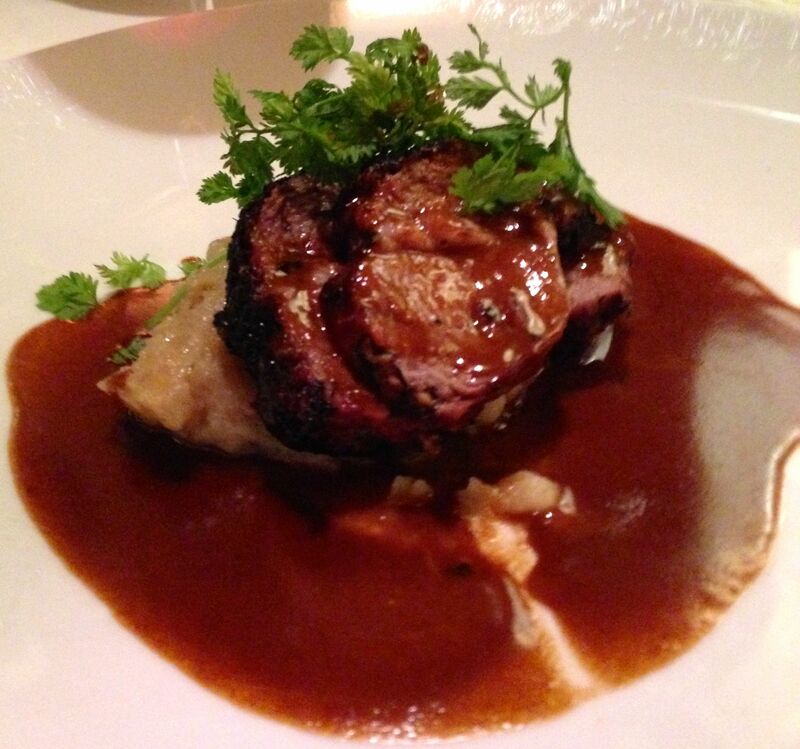 Erling Jensen does a Sunday Night Supper with a price that’s hard to refuse…three courses for $38. Sorry, my fork beat the camera to my Nicoise Salad. Take my word, it was good enough to be an entree. 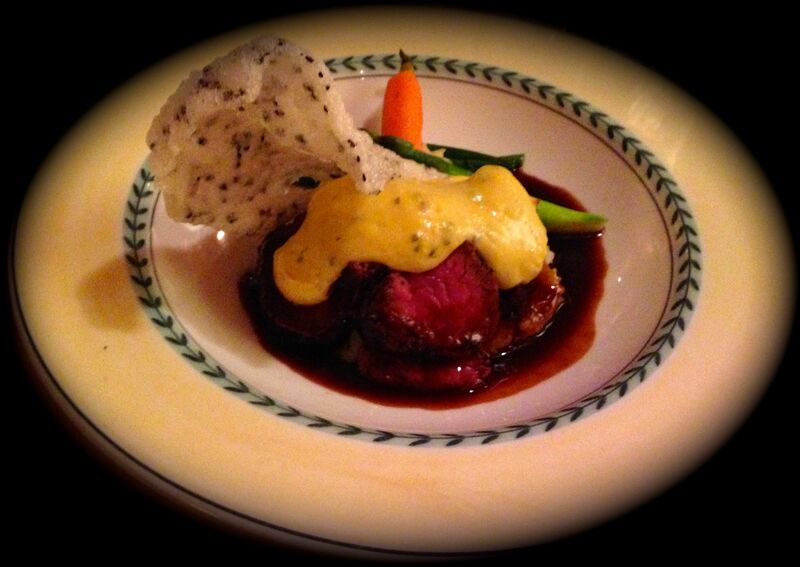 However, we were both in the red meat mood and the Lamb Loin and Buffalo Tenderloin entrees did not disappoint. 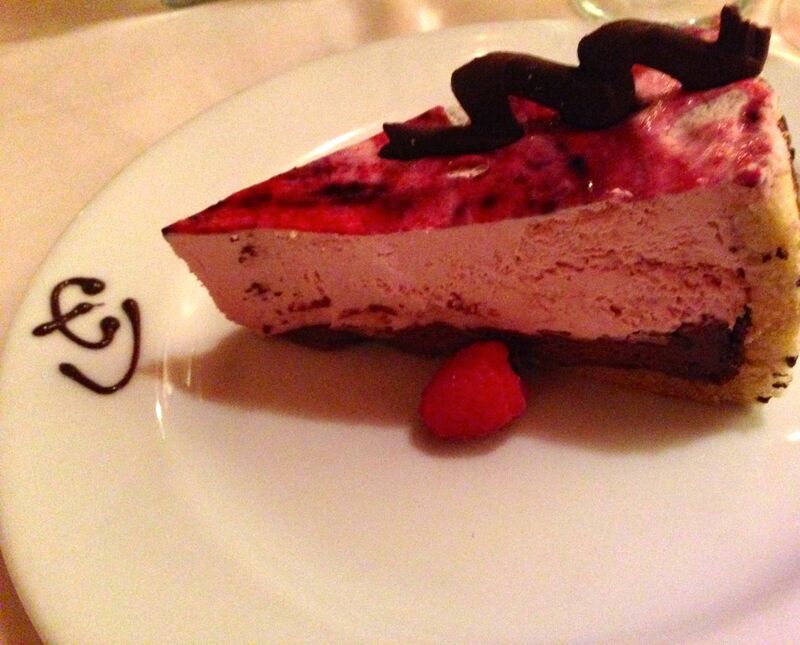 And, who can go wrong with Raspberry and Chocolate. The Amuse was not one of the courses, nor was the lemon sorbet between the salad and entree or the delicious after dinner sweets…Chocolate Chip and Apricot Cookies…this meal is a bargain…if you don’t drink…LOL. All I can say is we had such a good time…other guests asked to be moved away from us. Not fun to be them….but great fun to be us. 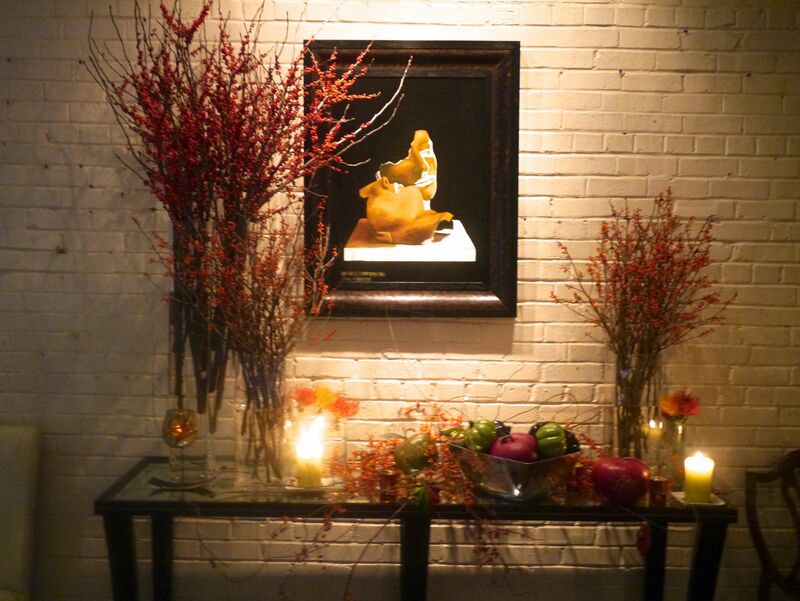 Last year we started doing the traditional Thanksgiving meal on Wednesday night. We kept that going this year with Turkey and I did it just like I would roast chicken…cut into pieces and roasted at 400 for a little over an hour. It is amazingly good. My sweet mother would put the turkey in when she went to bed and pray it wouldn’t be “too dry”. She would love to know all the new tricks I’ve learned. I made her “chicken and dressing” and her “green” salad (lime/lime congealed salad). We did the “pea salad” that Brandt’s family loves and we had mashed potatoes with giblet gravy and the requisite green bean casserole…it was so good at lunch today!!! I find the more I travel the more I’m inspired by the foods of other regions. Lord knows I can do mother’s cooking blindfolded. However, last year we did Bistecca alla Fiorentina for our Thanksgiving Dinner. And this year we went back to Italy for menu inspiration. 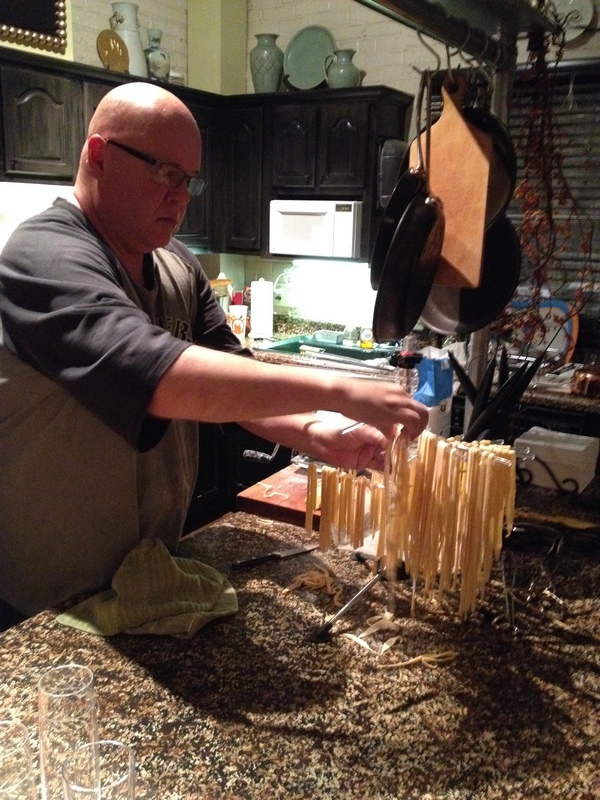 Last night we enjoyed the company of several chosen family members and enjoyed several Italian-style creations. I re-worked the console adding Bittersweet for texture. 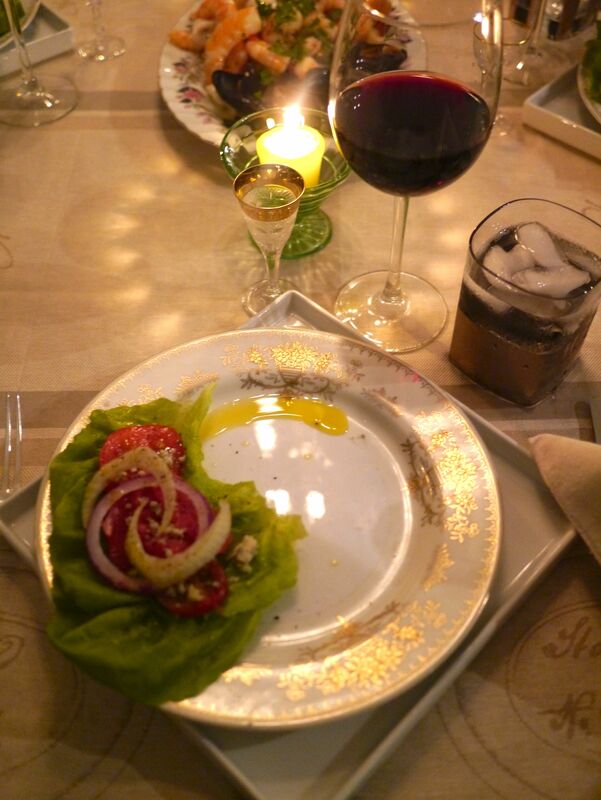 The table was very simple…for me. However, it was dressed with nostalgia. We had gerberas, tulips, sunflowers and amaryllis in my mother’s vases with bittersweet spraying out of the light fixture. The candles were in berry bowls that were my mother’s (Mother Pearl) grandmothers. The stunning Black Towers Windsor china (Japan) was flanked by exquisite silver flatware and gold rimmed apertif glasses from our dear friend Bucky. 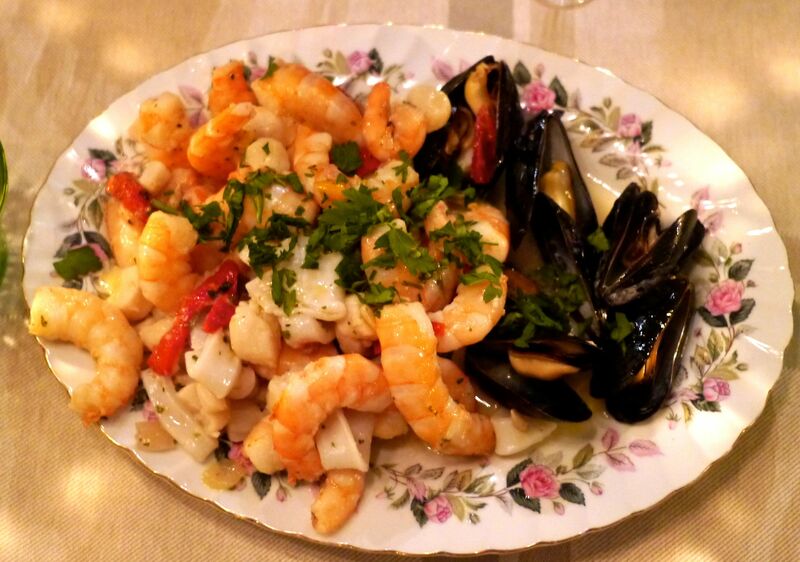 We began with a salad/seafood antispasti combination. 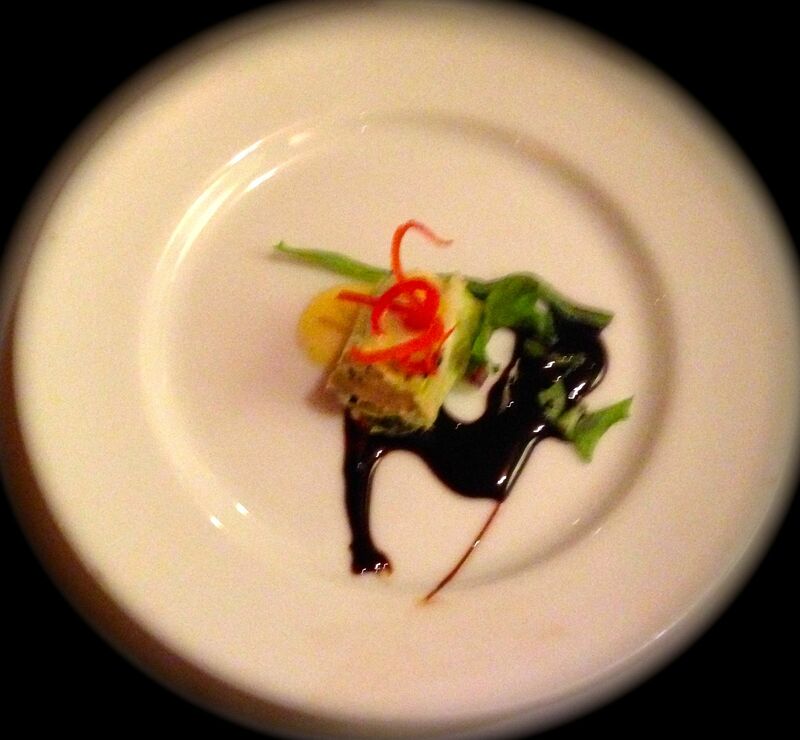 La Taverna dei Monti is one of our favorite restaurants in Rome. 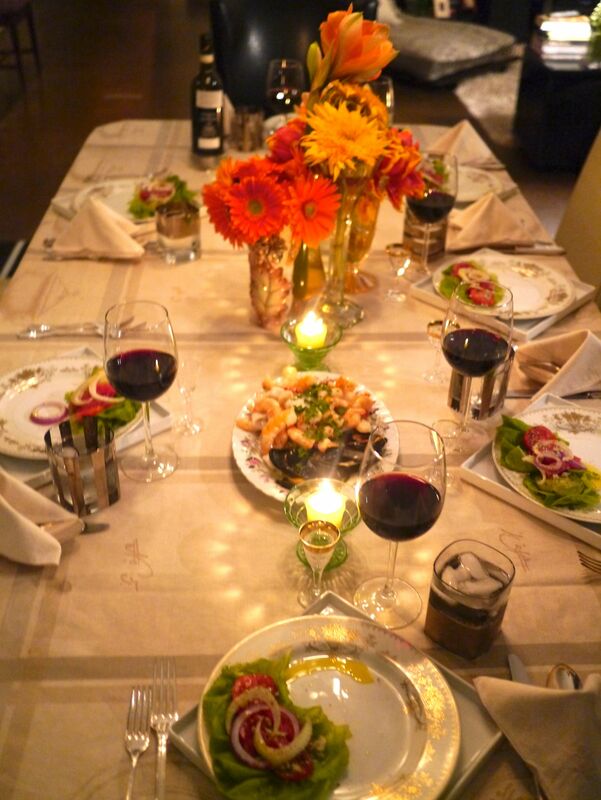 I tried to recreate their seafood antipasti…Brandt has already requested I do this again. Shrimp, Bay Scallops, Squid and Mussels with fresh herbs, lemon and 2012 Poggio Antico Olive Oil. 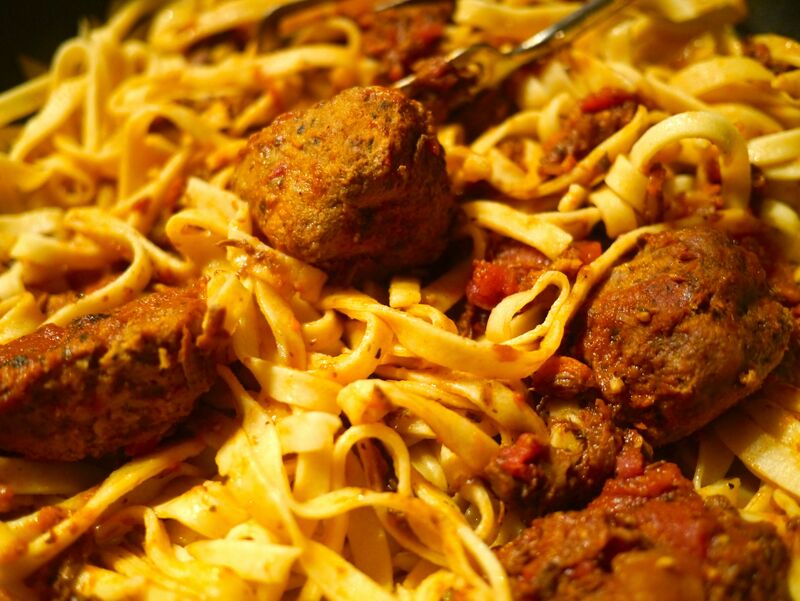 I made fresh fettucini and deconstructed a Braciole in a rich tomato gravy. 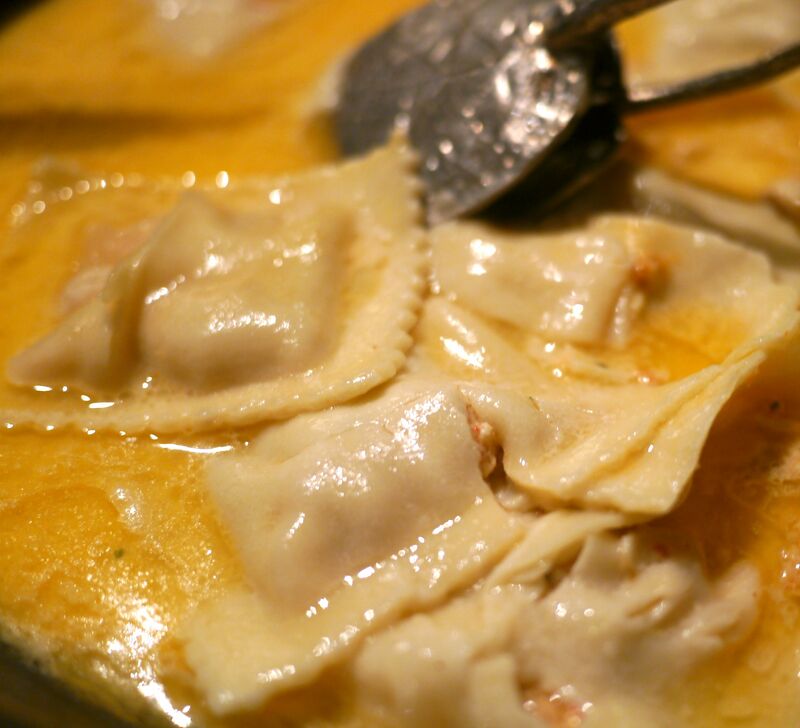 Lucchesi’s provided the Lobster Raviolis and I added a Champagne and Vanilla Butter Sauce. 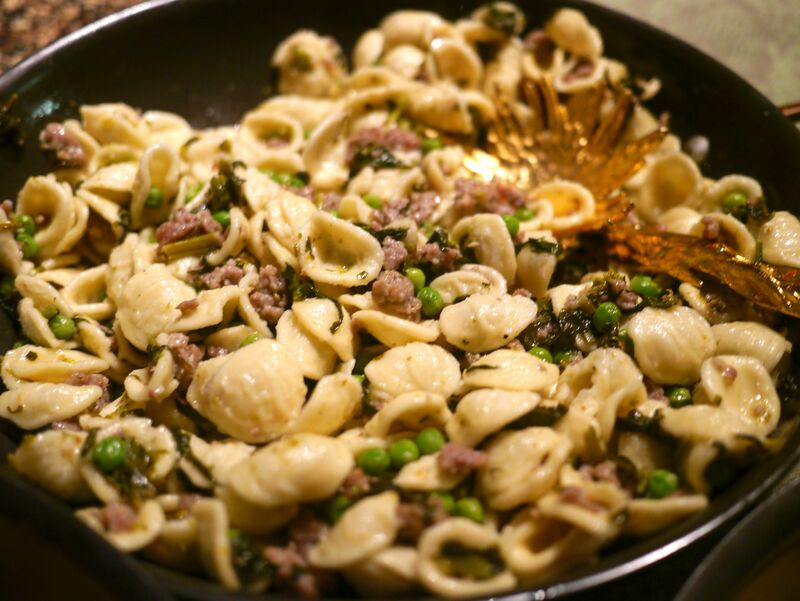 The hit of the evening was the Orecchiette with Italian Sausage, Rapini and Green Peas. 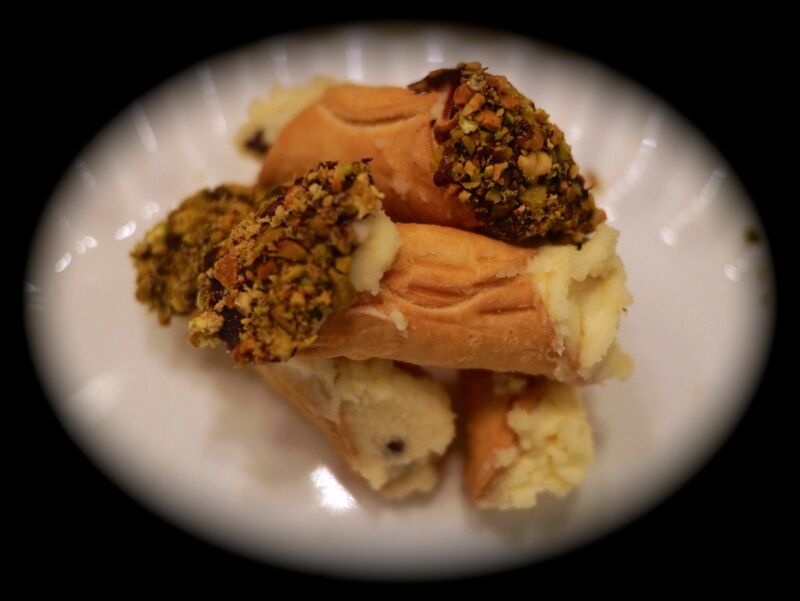 We finished the evening with homemade Cannolis with Chocolate and Pistachios……….and a tasting menu of after dinner apertifs. Happy belated Thanksgiving, Tim and Brandt! It all looks delicious, as usual. Come see us in NYC soon! Your Home look wonderful. I especially love the painting from Italy…………. Oh the memories of that trip are priceless. Sorry I missed another one of your award winning meals. Miss You Guys.